Record, share and collaborate for professional growth. Using ADVANCEfeedback®, educators, including teachers and coaches, can easily share their instructional practices with colleagues in professional learning communities—providing rich opportunities for growth. In a recent SmartBrief poll, over 90 percent of teachers indicated that they felt filming their instruction would help them grow professionally and improve their instructional practices. Capture video and audio from any device, in any video format. Upload and share video with one or more colleagues quickly through the intuitive platform. Improve instructional practices that will have an impact on student learning. Upload classroom video through an intuitive, quick tool. Embed context, clarifications and questions in the video to be shared with a colleague. 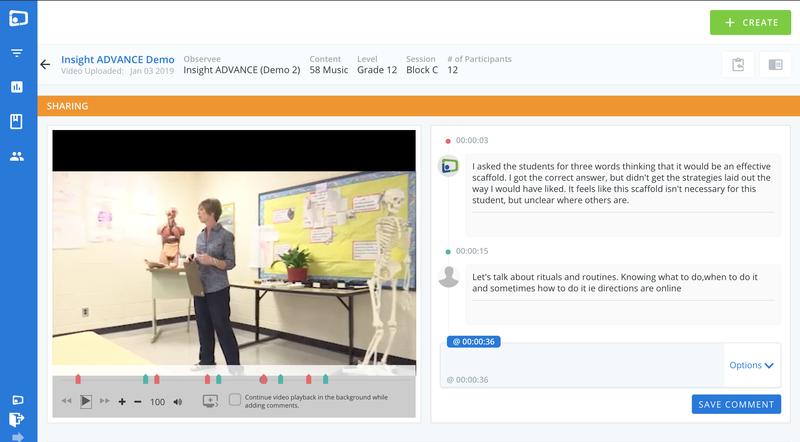 Share video lessons with colleagues to receive feedback from different perspectives. Review categorized comments by colleagues at specific moments in the video. Plus experience ADVANCEconcierge, our outstanding implementation support to guide you every step of the way for successful implementation of the platform.